We'll find out how to use region and track automation together. Until now, Logic's automation has provided only a 'whole' track approach, under which it's been impossible to separate automation for assignment to a single region from automation that unfolds over a longer period and across multiple bars. Of course, it's always been possible to create two automation curves - say a cutoff filter rise and a volume rise - and have them run at the same time. But if you then copy a region to make the filter change repeat every bar, you'll also copy the volume data. With Logic Pro X 10.1, though, this is no longer the case, as Apple's latest introduces all-new Region Automation options. Here's how both automation types can be used to work together. For more on Logic Pro X 10.1, pick up Future Music 290, which is on sale now. Step 1: Our track begins with two beat loops combining to produce a pleasingly off-axis, wonky feel. 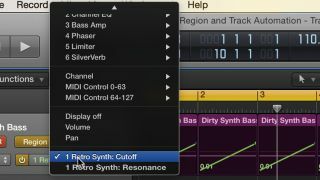 We add a held bass note from Retro Synth from a preset called Dirty Synth Bass, triggered in each bar. Despite some envelope shaping in the note, this is too static right now. Step 2: Firstly, we want to add a rising filter cutoff sweep to each bar. As each bar will be the same, Region Automation is what's needed here. We toggle the automation option from Track to Region, then create the cutoff ramp in Bar 1. This is then copied to the subsequent bars. Step 3: On top of this, we want to add varying LFO automation, so that the filter is further modulated by ever-changing LFO movement. As this won't be the same in each bar, we toggle back to Track automation and draw the LFO changes on top.